Gourmet pizza seven days a week! Are you in the Palo Alto area and craving some delicious deep dish, Chicago-style	pizza? Look no further than Pizza Chicago! For more than 16 years, we	have served the best-tasting, highest-quality pie around. 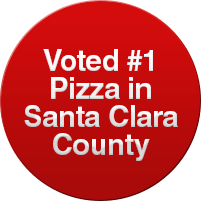 In fact, we	were voted “Best Pizza” by San Jose Metro and would love to	have you stop by one of our two convenient locations. Call us today at	(650) 424-9400 (Palo Alto) to order, or learn more about us and our tasty	menu by browsing through the website! We set ourselves apart from other pizza restaurants in a very obvious (and	delicious) way: our crust. Like the best Chicago-style pizzas around,	we still use corn meal, but the crust remains lighter and less heavy. With a great crunch on the outside and a delicate fluffiness on the inside,	you can rest assured that this is the finest pizza around! Our choice selection of only the finest ingredients is just one more way	that we separate ourselves from the pack. We select the best mozzarella	on the market, provide grate fine parmesan right at your table, and create	all of our sauces without the use of any preservatives. While this may	cost a bit more, we are confident that you will find this difference is	completely worth it. The first time you sink your teeth into one of our scrumptious slices,	you are sure to be hooked. Go with the deep dish experts at Pizza Chicago. If you are in Palo Alto and looking for that perfect slice of pie, stop	by today or call us at (650) 424-9400 (Palo Alto) to order delivery!